A new direction for standardized testing, expansion for charter schools, No Child Left Behind jettisoned and the aftermath of a cheating scandal: 2013 was a significant year for Texas public education policy. 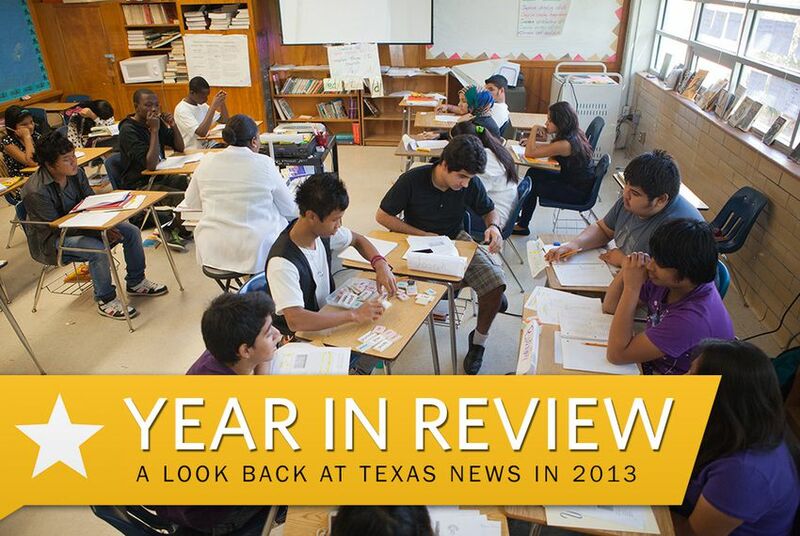 As 2013 comes to a close, we take a look back at some of the most important Texas stories of the year gone by. Let’s say this outright: 2013 ranks as one of the most significant years for public education policy in Texas in the last two decades. The last 12 months saw the rollout of a new school accountability system as the state dramatically changed course on high school curriculum and testing requirements, a direction it had followed since George W. Bush was governor. Along with the movement to scale back standardized exams, initiated by the activism of parents and educators, came an unprecedented backlash against the influence of for-profit companies in public education policy. It also brought a focus to the courses needed to earn a high school diploma, leading the Legislature to move away from requiring advanced math and science courses for all students — a decision that continues to generate concern about how it might affect academic achievement and college preparation in the state. The 2013 Legislature also approved the first expansion of charter schools in the state since they were established in 1995. Along the way, lawmakers lessened the State Board of Education’s involvement in the charter approval process and made it easier for high-performing charter operators to come to the state. The law’s proponents say opening the door to more seats in charter school classrooms will increase the educational opportunities for all students. But some education experts have questioned whether certain charter operators have a sufficient record of reaching out to the low-income communities whose students make up an increasing majority of the state’s public school population. The legislation was among the few successes in a slate of education reforms pushed by new two new interest groups that emerged this year with the goal of influencing policymaking. Other attempts to shake up the public education system also failed, including a proposal backed by Lt. Gov. David Dewhurst and Senate Education Chairman Dan Patrick, R-Houston, to allow parents to receive tax credits to help pay for private school tuition. But all of the activity didn’t stop lawmakers, just before they gaveled out for the first time in May, from laying the groundwork for a little-known state-developed curriculum system known as CSCOPE to turn into a big-time controversy — and headache — for the State Board of Education and school districts. The dust appears to have settled for now, but the issue continues to arise in Republican primaries. After the legislative session, and long delay, the state finally received a waiver from the federal No Child Left Behind law in October. Texas public schools are now freed from the policy that had its origins in this state, including a burdensome mandate that they provide private tutoring to students at underperforming campuses that resulted in few positive outcomes and widespread abuse. Amid doubts about its ability to investigate allegations of cheating violations following the El Paso Independent School District scandal, the Texas Education Agency also moved to step up its scrutiny of accountability violations. As 2013 closes, it’s possible next year will begin much as this one did: with school districts winning a round in sweeping school finance litigation against the state. Because of the legislative changes since then, Travis County District Court Judge John Dietz has decided to revisit the trial again in January. After Dietz’s second ruling, the case will likely still hang in the balance as it makes it way to the Texas Supreme Court. Its resolution, and the upheaval it is expected to bring, may land just in time for the start of the 2015 Legislature.